It had been several months since our last adventure, so a group (a big group) of us decided to explore the area around Nelson's Landing. This area is rich in gold deposits and has a long history in Nevada. It borders the Colorado river near the upper reaches of Lake Mojave. The area is rugged and peppered with mines -- just the place to go exploring. Toward the Colorado River from this point runs El Dorado Canyon where occurred one of the richest mining claims in Nevada History. Gold and Silver were discovered here about 1859 and soon rich mines were developed. In the 1880's the canyon was bursting with a rowdy population 500 men. Many of these said to be deserters from the Civil War. The river was navigable at this time making it possible to bring in food and supplies by boat. Notorious for its feuds and shootings the canyon was equally well known for its three largest mines; the Techatticup, Wall Street, and Swabe which yielded five million dollars during 40 years of operations. We meet at Westwood at 9:00am. Since we never really know who is going on these trips until the very moment of departure, we discover there are 17 people ready to depart. This is the largest group of adventures assembled to date and will require more than the typical compliment of vehicles. It is decided that eight vehicles will participate. There were plenty of available seats but a couple of us decided to take our own vehicles. I took my own vehicle just in case the weather and location permitted the opportunity to fly. Jonathan took his jeep just because "I have a 4-wheel drive vehicle". We zip down to the Nelson turnoff and the official marker of El Dorado Canyon. We stop, mill about for about 20 minutes, and pose for a picture (such as it was) before making our way on toward Nelson. There are only a few houses (mostly trailers) in the town of Nelson, so we decide not to stop and just to head further on toward the lake. A short distance past Nelson, we see what looks like a big mine. The map reveals this to be Jubilee Mine. From the amount of dirt piled up around it, the mine must be a big one. There were two cars already there when we arrived. We pile out, fetch our flashlights, and then proceed to the depths of the mine. At the entrance I meet up with another explorer. 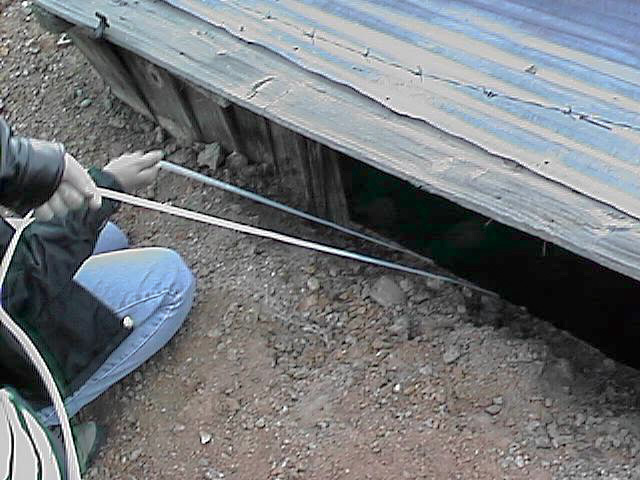 He is examining the area looking for gold or other precious ore. He doesn't have a flashlight to enter the mine, but he said some other people had recently been there and told him the mine goes quite a-ways back (he said it goes back a quarter mile, but this seemed like an exaggeration). Chris follows one tunnel that leads to overlook a lower tunnel where we are located. We descend into the mountain. Dang is the mountain dark. Even with the flashlight, it is pitch black inside. It is then that someone noticed I was still wearing my sunglasses. D'oh! Anyway, after a goodly distance along a downward sloping tunnel, it reaches a sharp turn to a wet dead end. However, there is a vertical shaft going upward with a large pipe extending upward as well. Eric decides to climb the pipe. This is pretty brave, but since the climb is taking longer than our patience will allow, we decide to not wait around to see if Eric reaches the top or falls to his death. We race off to explore other areas of the mine. Honeycomb of tunnels with many exits. The mine is a honeycomb of tunnels. The lower tunnels lead to an underground lake (not a huge lake mind you, but down there, it looked big). The upper tunnels lead to a multitude of exits. The mine was big enough that we could all split up and explore separate tunnels which is what many of us did. I exited the mine from one such tunnel only to turn the corner and find a bigger mine entrance gated off with some others trying to exit from that location. Unfortunately, the gate was not locked, so the taunting opportunity was rather limited. After exiting the mine and heading toward the vehicles, Anne discovers something in the desert. Ted rushes over to check it out and soon a crowd has gathered. She as discovered the infamous and feared Desert Horned Lizard! With great bravery, Ted was able to grab it without suffering serious injury. We cautiously gathered around to catch a glimpse of this example of fierce desert wildlife. This creature was literally covered with spines. If it were to leap with enough speed and accuracy, it could put out an eye! Or even clog a nostril! The upper reaches of Lake Mojave. It is time to mount up and proceed onward. The upper reaches of Lake Mojave are only a few miles away. After a short drive the road stops at a lookout point. We dismount and admire the view of the lake and surrounding mountains. The lake extends to the north and south of here. At this time, the wind started to pick up and it was getting a little chilly. Black storm clouds were rolling in and threatening rain. Finding our location on the map. We decide to stand around for about 20 minutes or so. It is possible to hike to the lake shore from this spot, but someone mentioned a story about how cars were vandalized at this location when previous tourists were hiking to the lake. We decide to heed this warning and look for another place to visit the lake. Examining the map, we see that there are some dirt roads several miles to the south that lead to the shore. We mount up and head out toward the alternate lake shore road. This road leads us into a wash with conspicuous warning signs. These signs warn of extreme flash flood danger. This makes sense since the town of Nelson was washed out by a massive flash flood many years earlier. The threatening rain from the approaching storm makes this little trip all the more exciting. Look at the jeep skidding sideways. The trailing vehicles are driving sanely. Notice that no wall of flash-flood water is following us -- thank goodness. The lead vehicle was travelling a bit slow for some of the jeeps, it seemed, because the jeeps started weaving back and forth trying to skid around. "Whoo Hooo" yelped over the radio confirmed this. The trailing vehicles were driving a little more straight. This might have something to do with the danger of flash flood. If you're constantly glancing backward for an onrushing wall of water, it leaves little time for swerving shenanigans. After a brief pause to let the trailing vehicles catch up, Chris notices a hissing noise coming from the tire of his jeep. Ooops, flat tire. A flat tire is expected on these off road trips since it has happened before. Anne is filling the tire up to regulation air pressure. With pit-stop efficiency, the group leaps into action. Even before Chris could get out of his car, Chuck was already approaching with a heavy duty car jack. Mike starts removing the lug nuts and Anne fetches a high-tech air compressor. The air compressor was needed because the spare tire only had 12 pounds of air pressure. The puncturing bolt is almost completely removed from the tire. While the spare was getting filled with air, Jonathan was examining the flat tire looking for the cause of the flat. It turned out to be a bolt. A rather large bolt. How could such a bolt puncture the tire? The conclusion was that the swerving and skidding around caused the bolt to wedge itself into the tire despite the bolt's blunt tip. During the remainder of the trip, there was no more swerving and skidding around by the jeeps. I wonder why. We reach Lake Mojave and naturally, we mill about for awhile. We're hungry and it's lunch time, so we hike around looking for a good spot to eat lunch. After only a short hike, we discover "Tower Number 35". This tower had a red light atop it. Apparently, it serves as a sort-of lighthouse for the boats. There is just no place that is sheltered from the wind, so we just sit down on the shore and watch the whitecaps, shiver, and eat lunch. Yawn. We came here to explore mines and stuff, so off we race back up the wash and toward the mines around Nelson. Chuck is atop the tower. As we get to within a few miles of Nelson, Chuck notices a strange facility off to our left. Naturally, we had to check it out. There were lots of "No Trespassing" and "Contamination Warning" signs, but we just didn't notice them. This appeared to be some kind of ore processing facility. There was lots of equipment that appeared to be in working order. There were large drums, vats, pipes, conveyor belts, and motors. Inside the building, there was little in the way of furnishings except for newspapers (circa 1996), oil cans, junk, stuff, knickknacks, doodads, and other miscellaneous things. Actually, it was pretty darn empty considering the size and number of rooms in the interior. We head back toward the area around Nelson. There are plenty of mines around here. Specifically, we are looking for a vertical shaft. There were mines as far as the eye could see -- probably hundreds. There were many old mining buildings as well. It was now time to perform the task for which this adventure was begun -- to use the Shaft-Cam. The Shaft-Cam is a camera secured in a protective box and attached to ropes. This camera sends an image (by radio) to a receiver monitor on the surface. The plan is to lower the camera into a vertical mine shaft in order to see what is down there. Over-all, a device of ingenious technical wonder. I'm not quite sure what we expected to see: Maybe a dead body? Piles of gold? A monster? There were countless tunnels in the area, but most were disqualified either because they could be walked into (obviating the need for the shaft-cam) or were not vertical enough to lower the camera into. Eventually, after much hiking and driving around, a suitable vertical shaft was discovered. The shaft-cam was assembled and made ready for descent into the depths of the mine. With much anticipation it was gently lowered by two volunteers while the rest of us huddled around the video display to catch a glimpse of what lay below. It soon became apparent that there were several flaws with this technological wonder. The camera was being lowered by two ropes. This meant that it was extremely difficult to keep the camera level. Unless the ropes were let out at exactly the same rate, the camera would tilt straight up or down. There was insufficient light available to pick up an image. The only light was a flashlight taped to the camera. This provided far less than the minimum illumination required to capture an image. The greatest flaw of the shaft-cam was that it sent its video image by radio to the receiver. Radio doesn't travel through rock and the receiver couldn't be placed directly over the shaft. The result was that an image could be received for only a few feet down -- just about as far as we could see by looking down the shaft normally. It was just then that we discover the most interesting thing on this trip. Nuclear Bunker / Crypt / Control Center? Ted enters the strange entrance. Located nearby was a well-developed entrance to the side of the mountain. It had power lines leading to it, a metal door, and the obligatory "keep out, no trespassing" signs. The metal door was quite thick and would have prevented our entry were it not for the fact that someone had blasted quite a large hole in the door where the lock would have been. Naturally, we had to explore this, uhh, whatever it was. The entrance to the mountain. What lies beyond? Let me explain what we found and you can draw your own conclusions. There were power lines leading to the entrance along with various electrical switch boxes and levers. This was followed by the heavy steel door (previously described). Beyond the door about fifty feet was a sort of control room. There were desks, a chalk board (with writing and chalk still present), chairs, overhead florescent lighting (non functional), and a command phone (with special dialing instructions). A tunnel led on from this room for another 50-100 feet or so to a larger room. This room contained benches along the walls. The center of the room was dominated by a large concrete slab covering the center of the floor. The concrete slab length to width ratio was something like nine to three. The slab was smaller than the room, only about six inches high (although it seemed to be rooted deeply into the floor) and had several odd looking brackets mounted on top. The walls of this room were covered with gossamer translucent crystals that crumbled to the touch. The walls along the length of the main tunnel were lined with brilliant white veins of rock. It was suggested that the concrete slab was a cap to a mine shaft or elevator. The strange brackets, odd dimensions, and lack of supporting superstructure around the slab indicated otherwise. One of the Nelson residents mentioned that during the '70s, as part of the nuclear test threshold treaty verification, the Russians were allowed to set up a seismic monitoring station in the vicinity in order to verify the yield of any underground nuclear tests conducted at the test site. Maybe this is what this place was for? That might explain the 'office' room and the brackets and concrete slab (solid foundation for the seismic instruments). We may never know. After the excitement dies down we decide to head back to town. Taking an unfamiliar road back to the highway, we end up making a wrong turn. The road wound up the side of a mountain and ended at a radio tower facility at the top. The view was incredible, but the wind was strong and very cold. We could only stand about 20 seconds of this before heading back down the mountain. Taking the correct road this time, we reach highway 95 and head back to Las Vegas. Yet another field trip successfully completed!